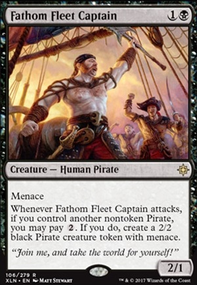 Go wide with unblockable pirates to steal opponent's permanents via Admiral Beckett Brass. Sleeved up in Dragon Shield matte gold. Admiral Beckett Brass in some random skeleton pirate sleeve (probably Legion). Tokens in Ultra Pro matte black.